We make all our coatracks in our workshop from reclaimed floorboards. The come supplied with the brass hangers on the rear of the board so that they can be mounted onto your wall. This one is a "Strasbourg" design and is painted in Shutter Grey with a Black distressed outer edge. 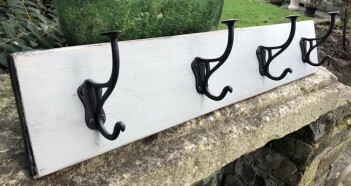 We have attached 4 black cast iron A frame hooks to the board.